Verdicts of accidental death were returned at Dublin Coroner’s Court today. Annemarie O'Brien (bottom left), her daughter Paris (top left) and her niece and nephew Holly and Jordan all died in the fire in March 2017. 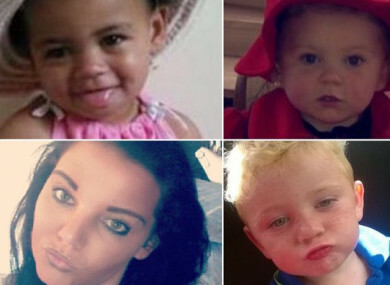 A DEVASTATING FIRE that killed three young children and a pregnant woman began with a tea light candle, an inquest has heard. Annmarie O’Brien (27), who was eight months pregnant, her daughter Paris (two years old), her niece Holly O’Brien (22 months old) and nephew Jordan McGinn (four years old) died in the fire in Clondalkin, Dublin 22, on 8 March 2017. Verdicts of accidental death were returned at Dublin Coroner’s Court for all who perished. The fire started on a shelf under a TV in the living room and tea lights were found in debris there, Dublin Coroner’s Court heard. Annmarie’s sister Biddy O’Brien, was the sole survivor of the catastrophic fire that broke out shortly before 2.30am. She told an inquest that she visited Annmarie, who was living with her daughter in supported accommodation, every week. She arrived at the apartment before Annmarie on 7 March 2017. Staff let her in and she cleaned the apartment, burned rubbish in the fireplace, bathed the children and made porridge for them. Annmarie attended a hospital appointment and arrived home around 6.30pm. She’d been told that day she was to go her own home. The children played on an iPad before going to bed at 9pm, Biddy O’Brien told the court. Neighbours heard singing from the apartment late that night. Biddy O’Brien said the pair drank a box of beer between them and listened to music. She said her sister loved tea lights but there were none burning that night. “I remember lying down on the couch. I remember Annmarie going to her bed. After that, nothing,” Biddy said. Neighbours heard the building’s central fire alarm go off at 2.30am. They banged on Annmarie’s door before taking their children out of the complex. Members of Dublin Fire Brigade entered the apartment wearing breathing apparatus. “Visibility was zero. Dave (a firefighter) found a baby in a nappy. He picked up the child and left the building. I found a child, either standing up or sitting on the couch, a little girl. I left with the child and handed her to a firefighter,” firefighter Keith Conroy said. All five of the occupants were rushed to two hospitals in four ambulances. Bridget O’Brien identified the bodies of her grandchildren hours later. “I only found out what had happened when I saw them,” she said. Forensic examiner Paul Collins investigated the fire on behalf of gardaí. “The fire was an accident and mostly likely the consequence of a lit tea light or candle setting fire to a large TV screen,” he said, adding that hot gases from the burning flame set the TV alight. It’s very quick. Once the plastic goes on fire it generates vast quantities of black smoke. Two fire alarms had been dismantled and were hanging down with batteries removed. A third inside the front door was operating, he said. A neighbour told the inquest said she and Annmarie had tampered with the fire alarm in the kitchen prior to the fire. “It went off one day when she was cooking. We got up on a chair and tried to turn it off but it wouldn’t go off. We fiddled with it. Eventually it went off by itself,” the neighbour said. Post-mortems on the children revealed they died of brain damage secondary to smoke inhalation. Annmarie O’Brien died due to carbon monoxide poisoning. Coroner Dr Myra Cullinane returned verdicts of accidental death for all who died in the fire, including Annmarie’s unborn baby AJ. “The very fact of going through so many verdicts in relation to tiny babies, it’s very moving. I offer my deep condolences on your tragic loss,” the coroner said. Email “Devastating fire that killed pregnant woman and three children was caused by tea light ”. Feedback on “Devastating fire that killed pregnant woman and three children was caused by tea light ”.